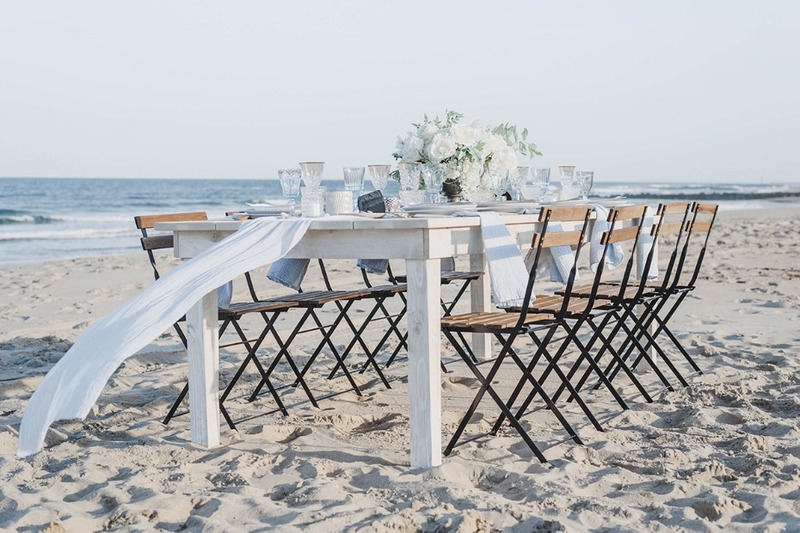 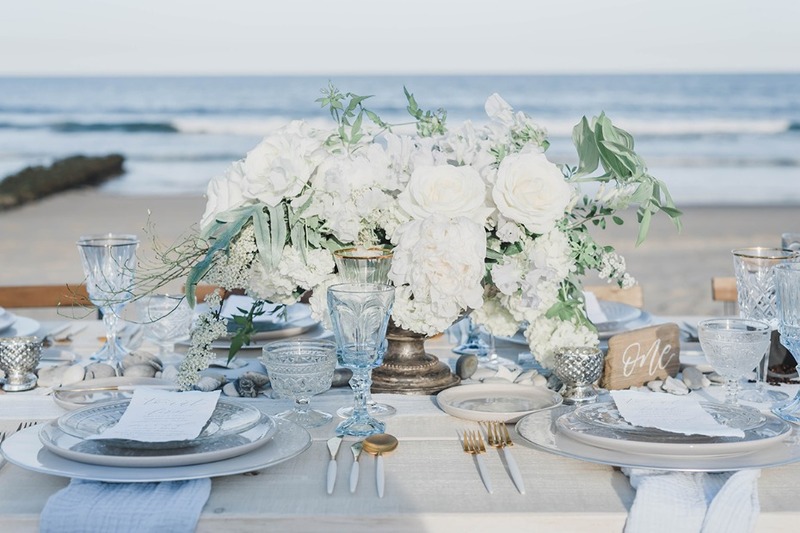 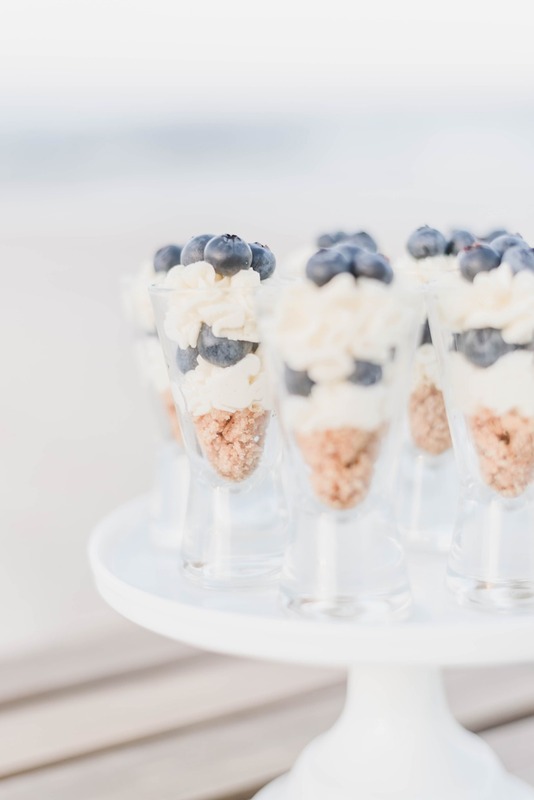 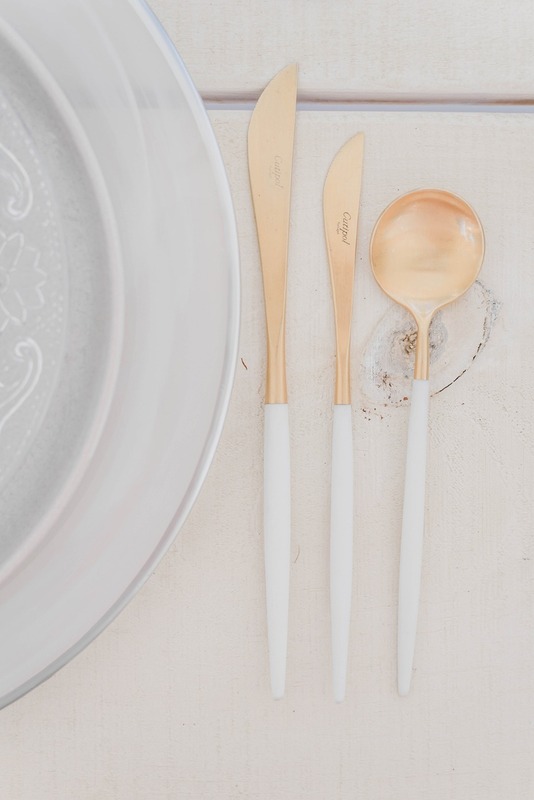 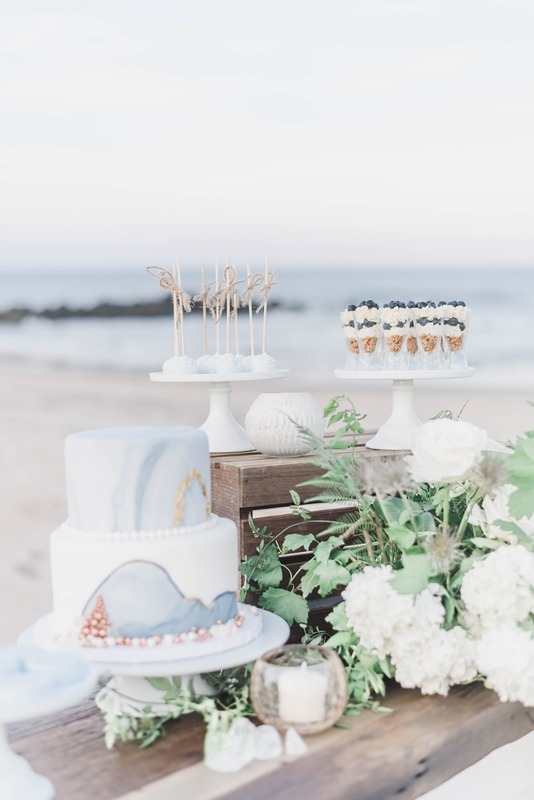 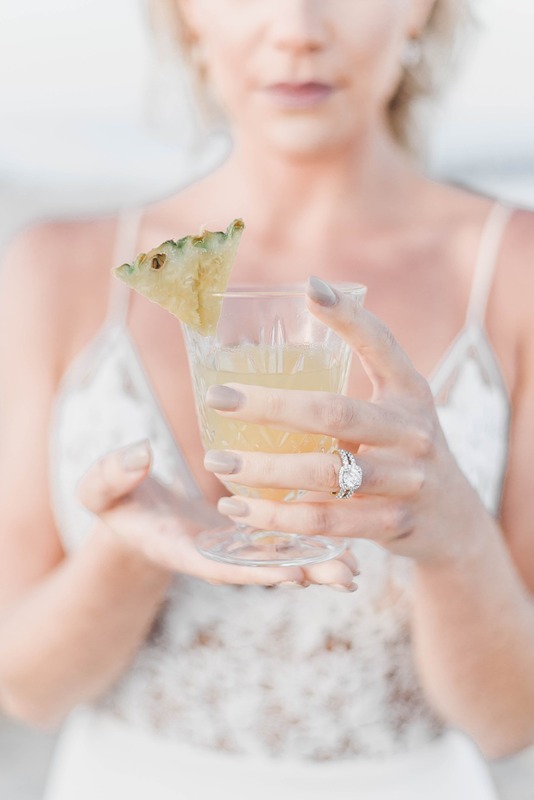 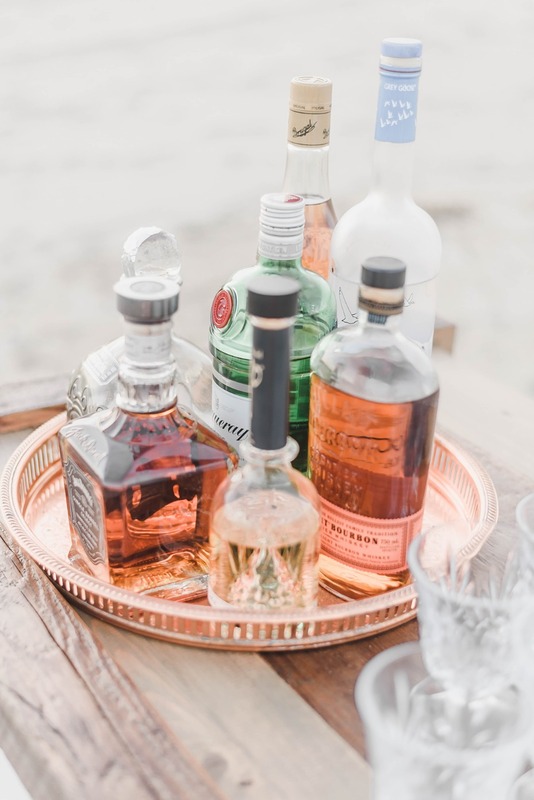 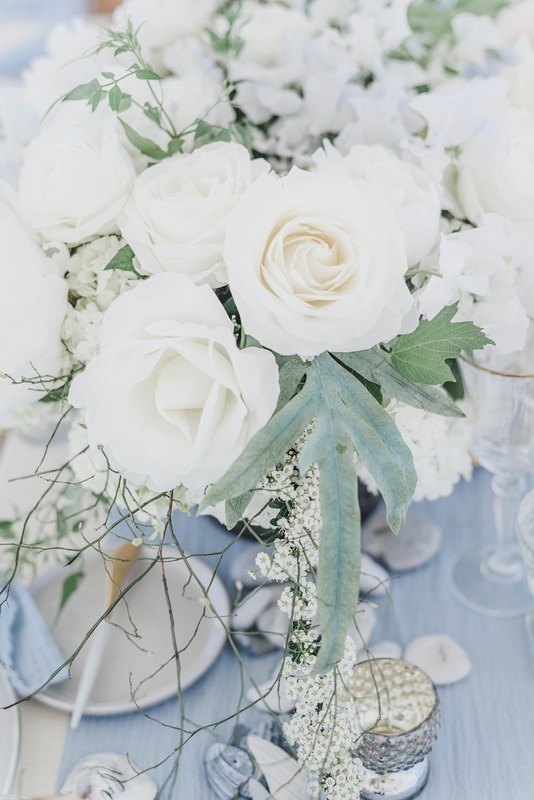 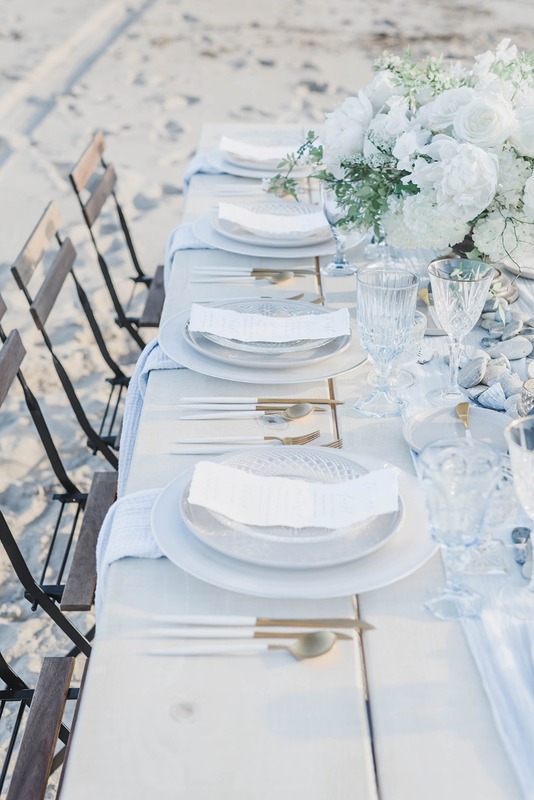 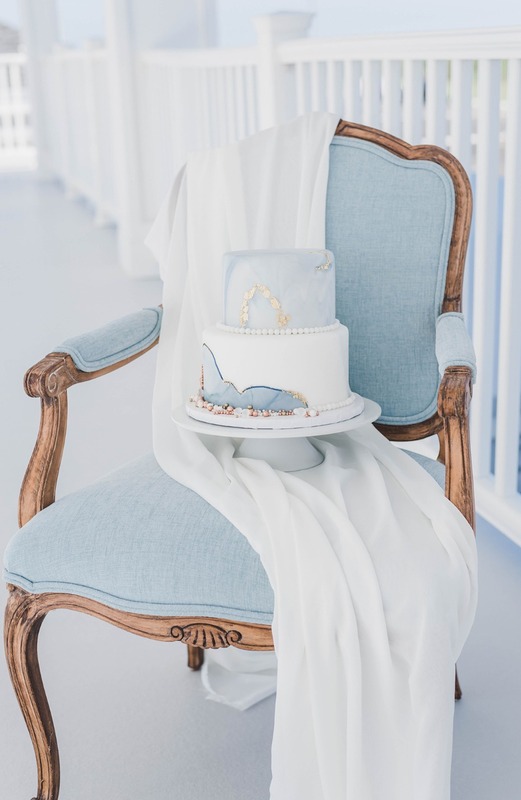 Our friends over at Copper + Chloe have some stellar decor taste, so when they gave us a peek at this beachfront wedding inspiration that had not just one but two great ideas to style your ocean themed wedding day we knew we just had to share it with you! 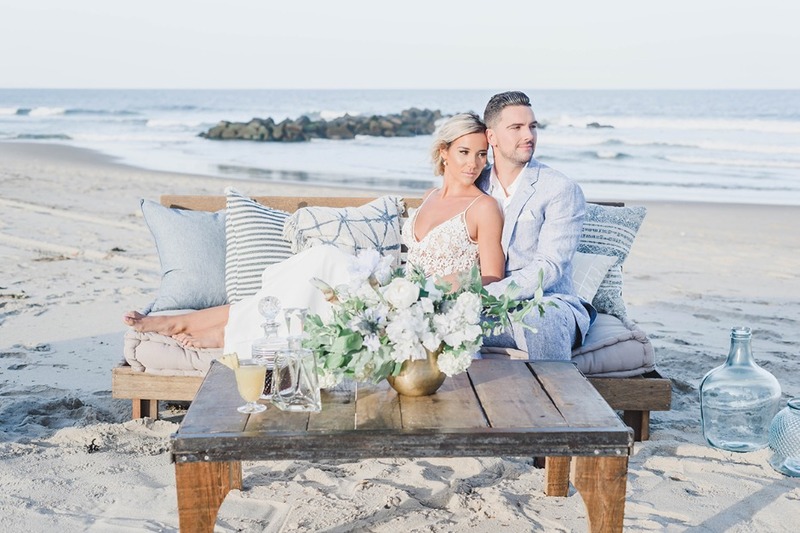 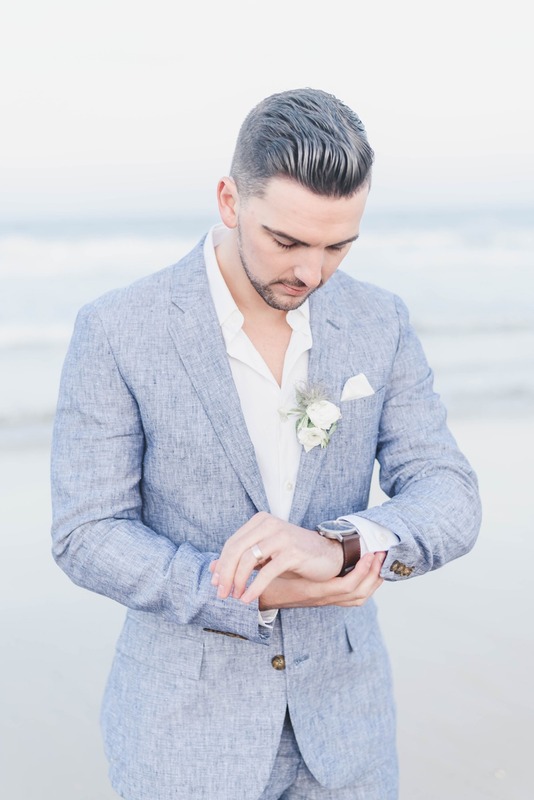 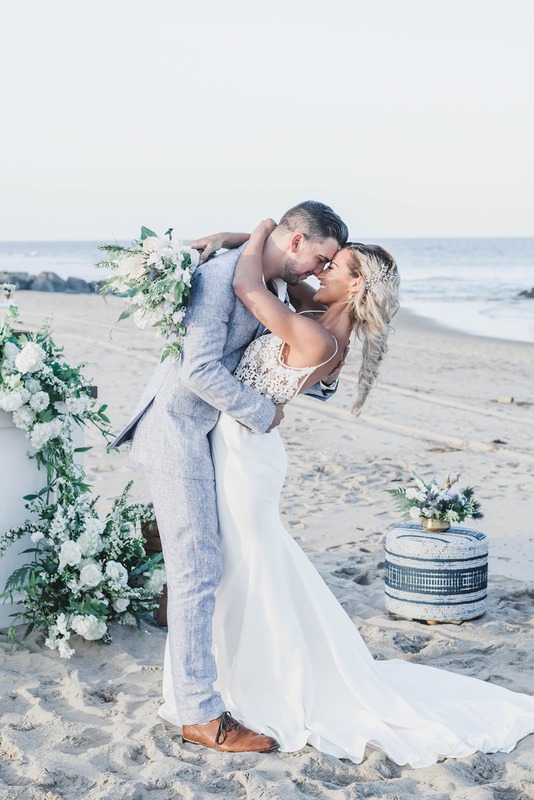 So if you are more of a carefree soul who loves any chance to wiggle your toes in the sand, OR you enjoy the beach but love a chance to get fancy and feel formal this wedding shoot has just the thing for you! 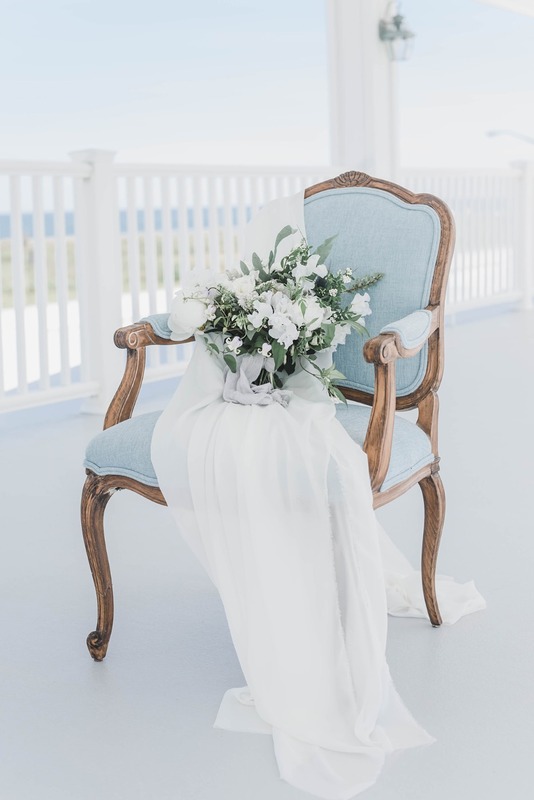 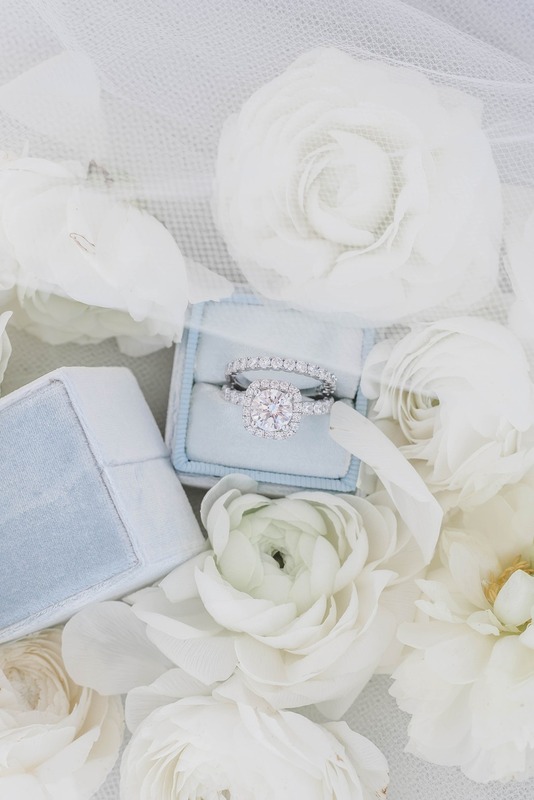 Be sure to stop by the full gallery where you will find even more lovely photos from Molly Sue Photography. 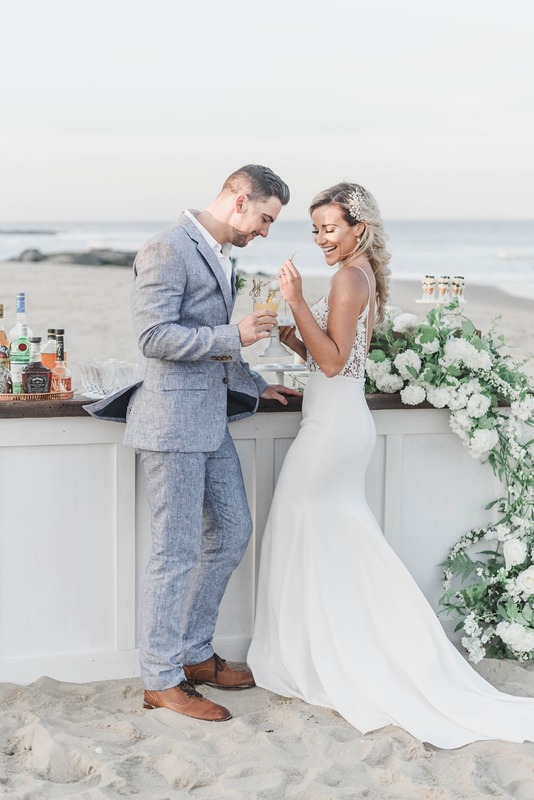 Inspired by the blue waters of the Pacific Ocean from a trip to Malibu, California, the Spring Lake Bath and Tennis Club was the perfect venue to bring back those memories. 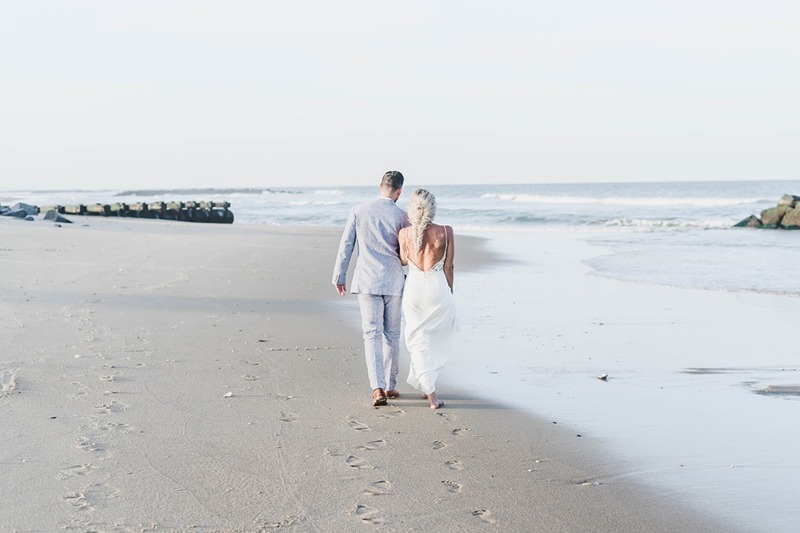 The calm waters of the Atlantic Ocean on a warm but breezy Spring day had me reminiscing about that time. 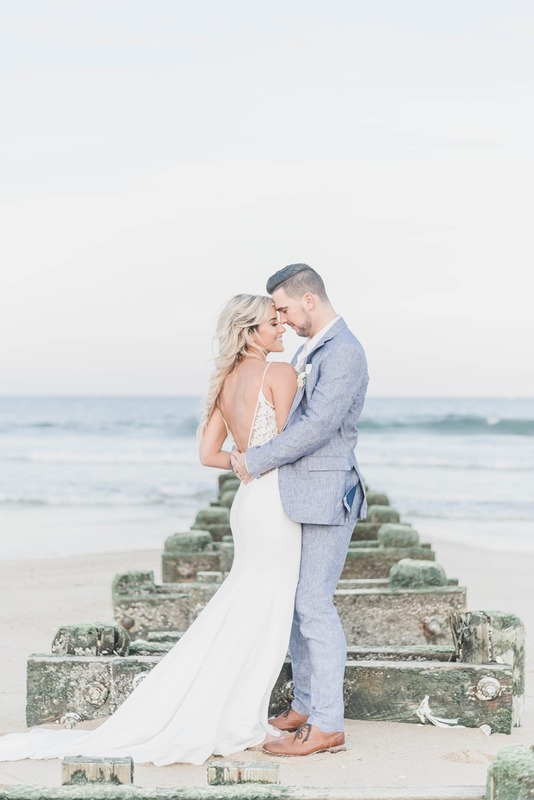 With the beach views directly across from the venue, I knew that we would get the most magical shots when the sun started to set. 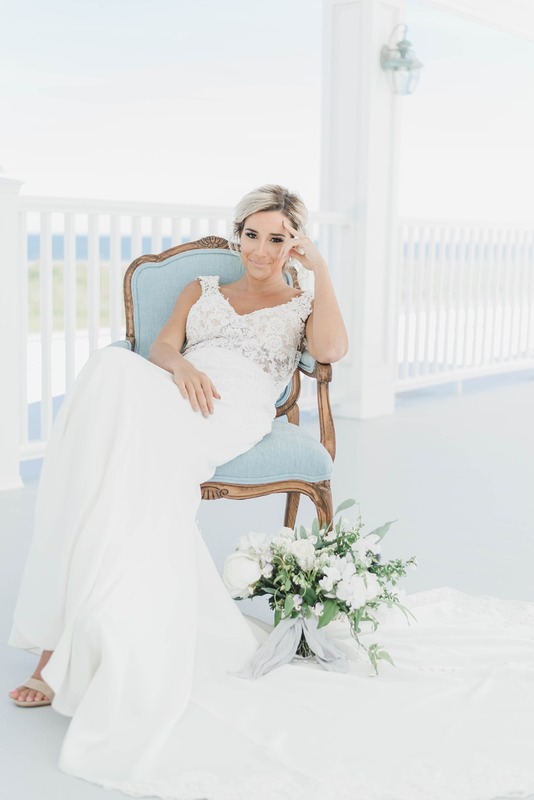 When I came up with the concept of an Al Fresco beachy shoot, I immediately knew that I wanted Molly from Molly Sue Photography to capture this. 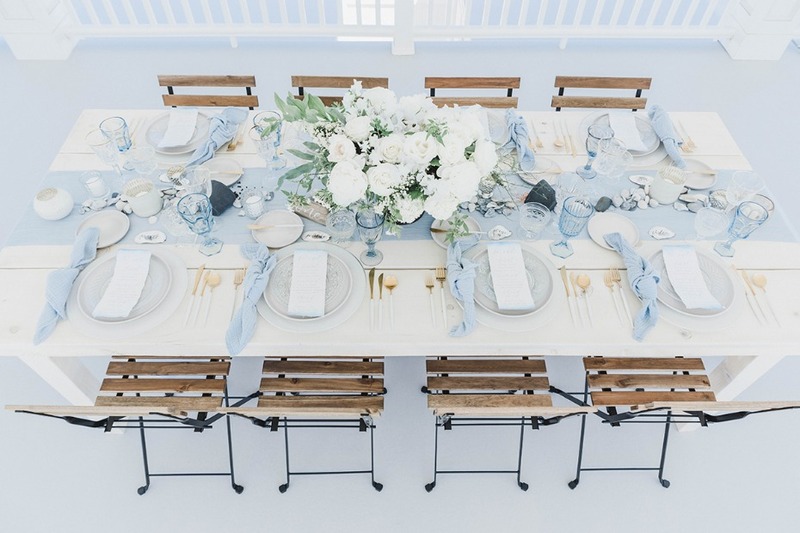 Her light and airy photography emulated the style and vibe that I was hoping to create. 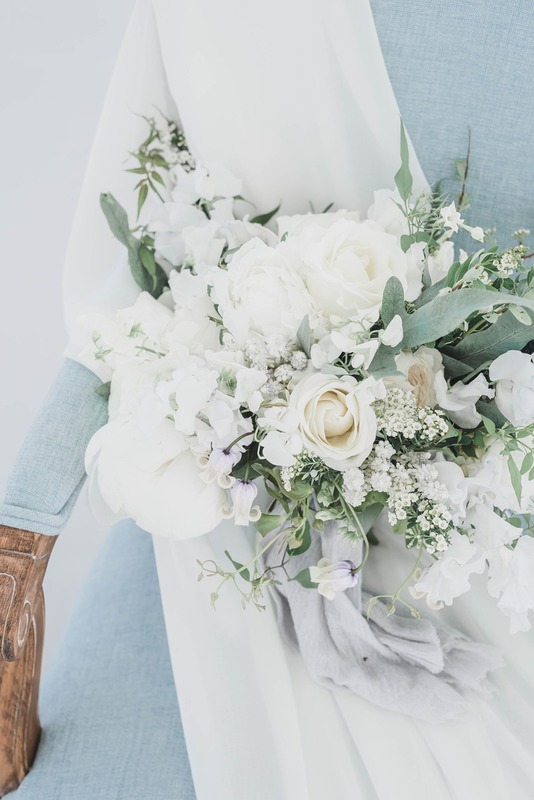 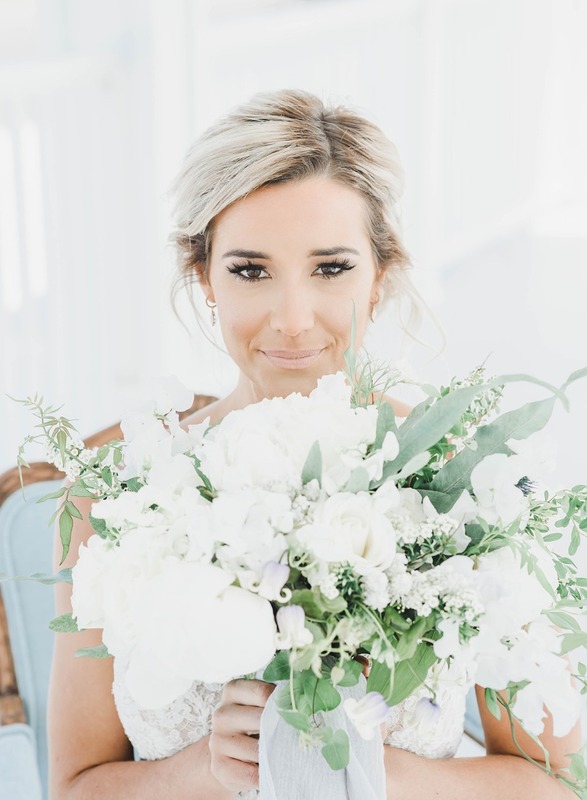 Chelsie from Flower Child Florals, who grew up on the West Coast, created the most beautiful white and organic feeling arrangements. 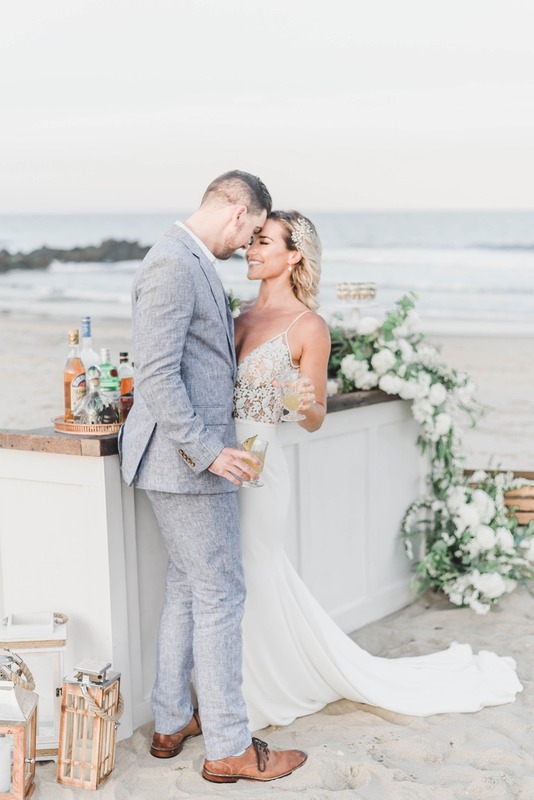 Everything she designed from the tabletop to the bar florals on the beach, was so romantic and effortless, which completed our overall vision and design. 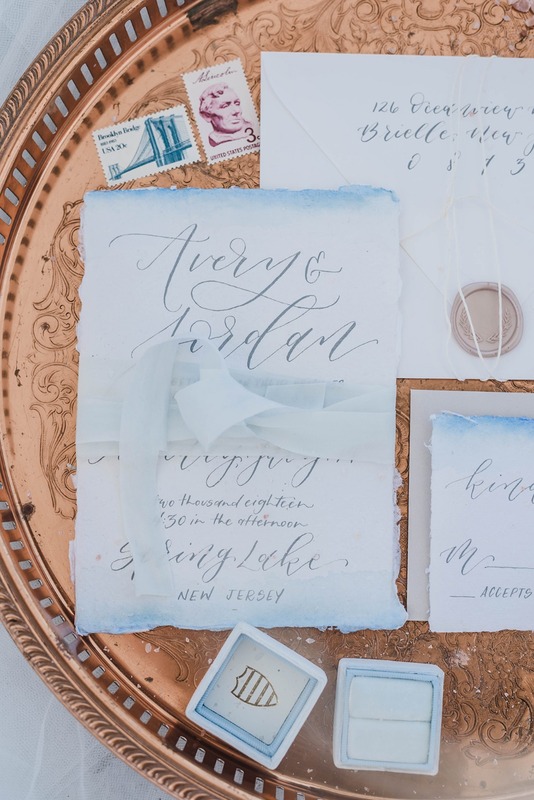 So much thought and preparation were put into every single detail and piece of décor. 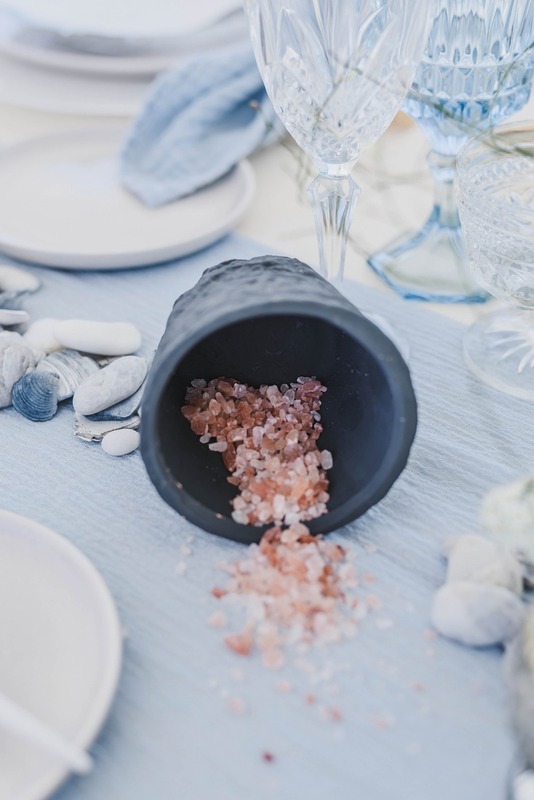 From the hand-lettered deckled edged menus with watercolor paint created by the talented Alane Gianetti from Write Pretty for me, to the pink Himalayan sea salt pouring out of a jetty inspired salt keeper. 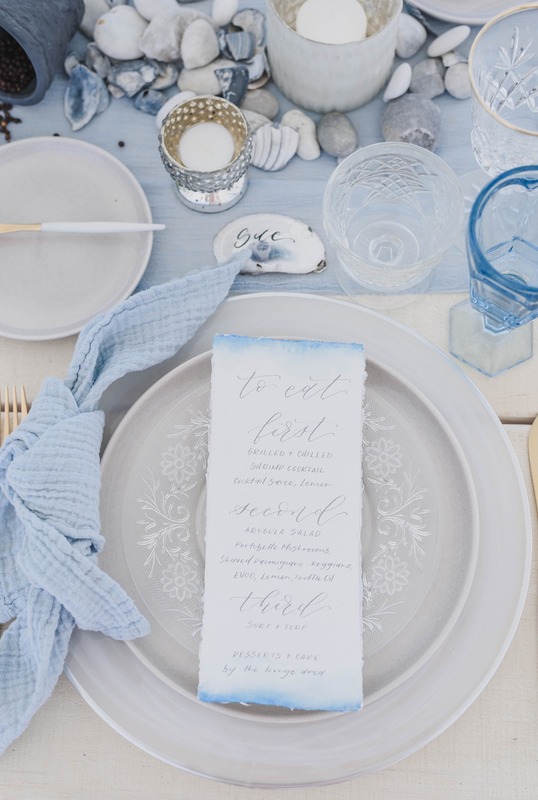 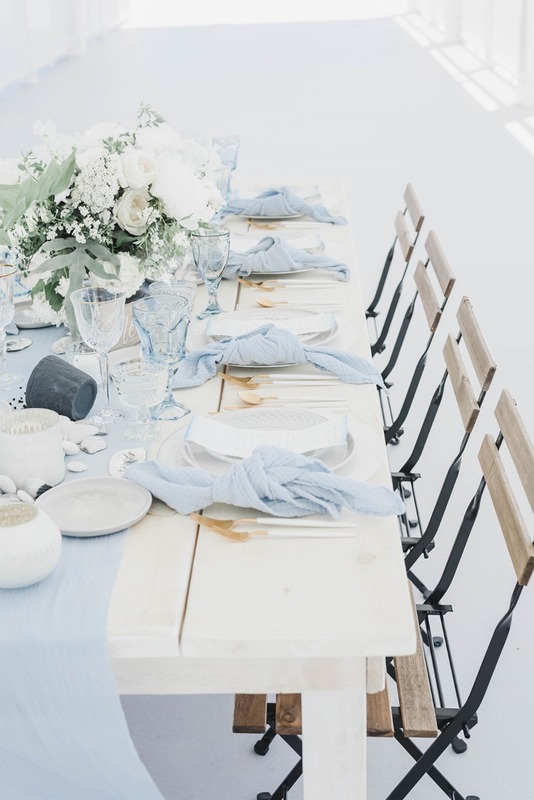 The tabletop items from Borrowed Blu were the perfect combination of blues, grays and crystal glass. 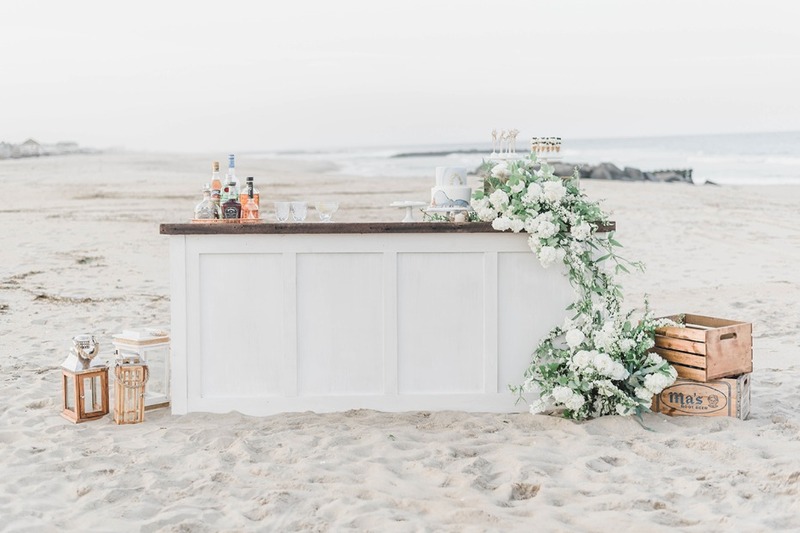 The bar and lounge area, provided by Rustic Drift, reminded me of being on the calm, serene beaches of Malibu, California. 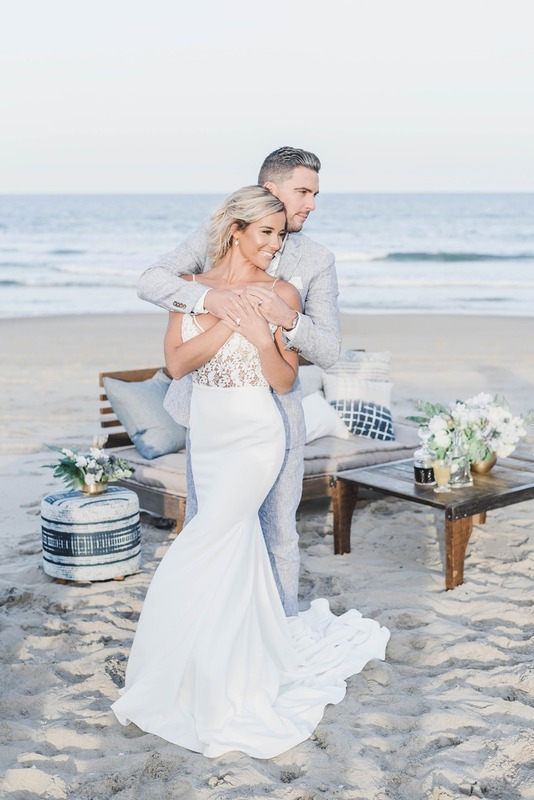 My inspiration was complete with the most beautiful gowns from our local bridal boutique. 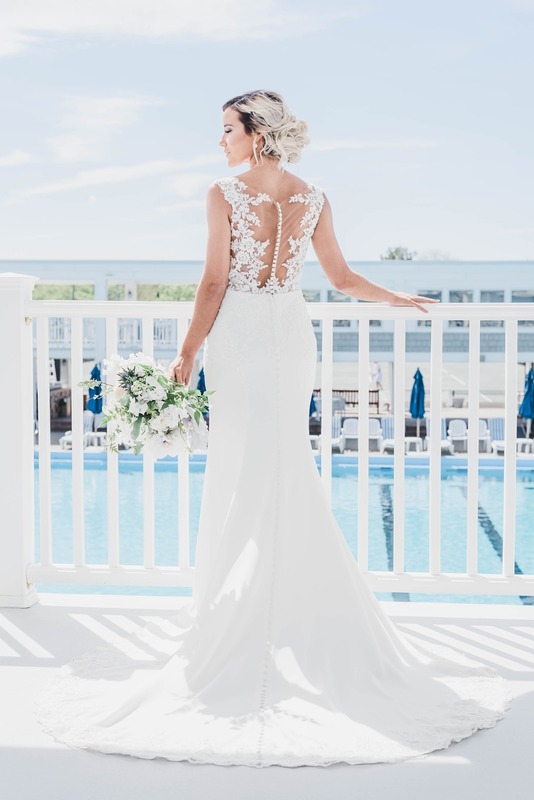 An elegant, but more formal lace gown by Miss Stella York that had buttons going all the way down the train with a classic updo, was the perfect fit for the venue. 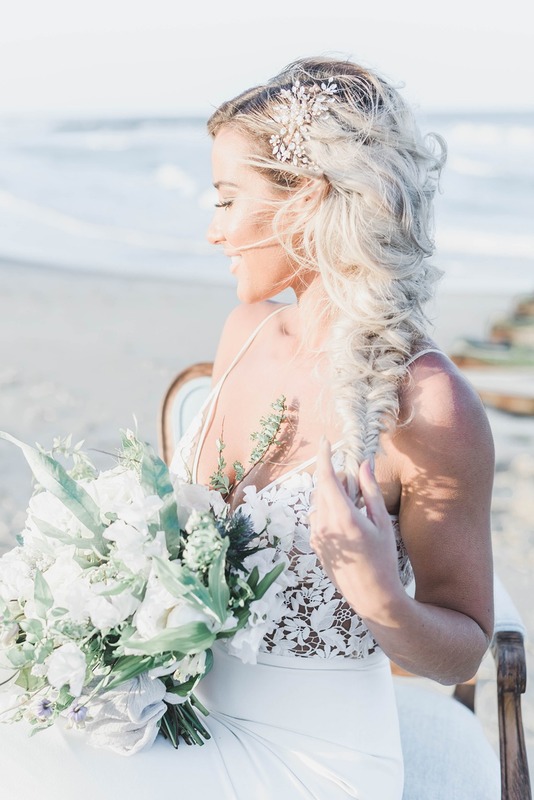 Then let loose onto the beach by switching the hair to a fishtail braid with the airiest and flowy gown by Mikaella Bridal. 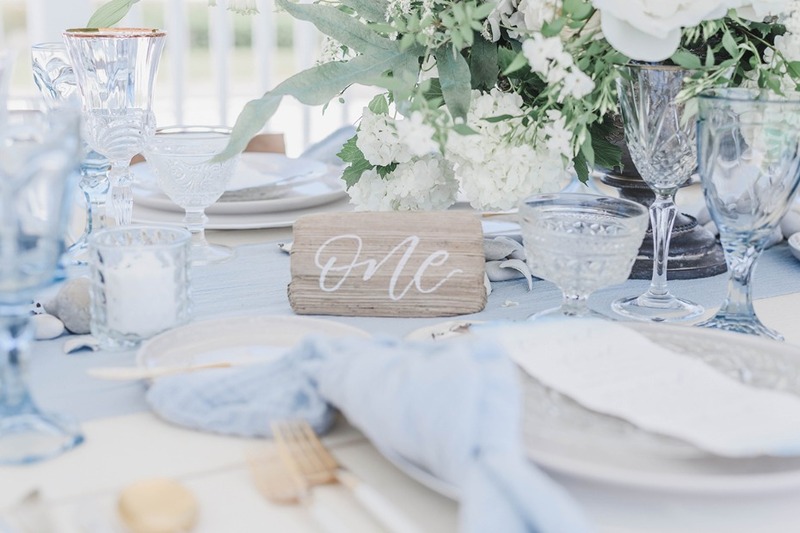 You can get a closer look at this fabulous ideas thanks to Tone Media.